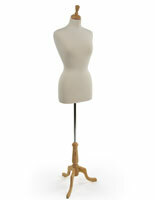 This black dress form is a chic and elegant store fixture for displaying clothing, accessories, scarves, and more. 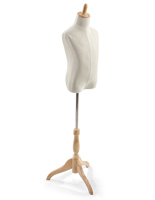 Each standing bust features a size 8 ladies torso. This female black dress form naturally wears clothing merchandise such as dresses, shirts, and jackets. 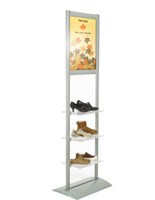 This display style allows browsing customers to see how certain items would appear on the human body. This size 8 black dress form may help to generate additional product sales by attracting guest attention and drawing it to certain products. Because the half mannequin is entirely dark, it blends in well with surrounding retail settings and allows colorful merchandise to pop! This black dress form that is jersey covered has a plastic bust interior. Though this mannequin is not pinnable, it is ideal for showing complete fashion styles. This black dress form, also called a boutique store fixture, can hold accessories such as jewelry or scarves around the neck. 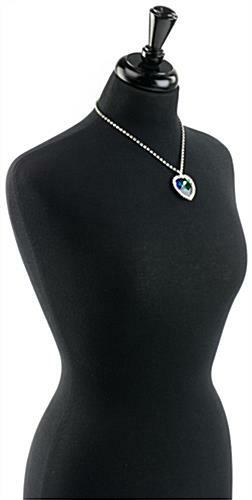 One may cover the bust in vintage-style fashions to create an antique or elegant look. 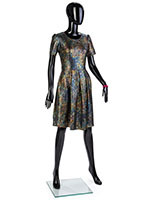 This black dress form that is ladies size 8 features a painted wooden neck block and base. The stand is easily assembled and does not require tools or more than a few minutes to put together. 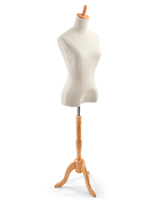 This black dress form that has a wooden base is height adjustable. 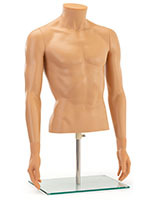 Simply slide the torso up and down the pole and tighten a screw under the bust to secure it in place. 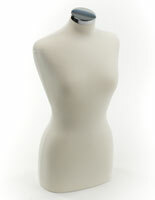 This half mannequin, black dress form is incredibly chic and attractive for boutique store settings! The dress form that I ordered was everything I hoped it would be. Its beautiful, great quality, and I wish I had ordered 2. I would definitely recommend ordering DFBF8WBBK - dress form to anyone.